James Welles’s book, The Story of Stupidity (first published 1988) is a sweeping chronicle of Western civilization, with a decided slant as indicated by the title. Welles’s grasp of history is actually quite impressive. But his unrelenting cynicism and pessimism make his book as stupid as anything he discusses. That’s the kind of trite, pseudo-profound, ultimately stupid posturing that fills the book and makes me want to retch. It’s easy enough to find examples of stupidity throughout history. But Welles epitomizes an all too common misanthropy of pervasive contempt for Man and all his works. Ironically, he often inveighs against historical victimizations, yet it’s hard to see why he cares about those victims, since he apparently has no use for any of the human race. Not, at least, as it actually exists. Welles relentlessly condemns people for failing to measure up to an ethereal standard of sagacity, virtue, foresight, selflessness, and perfect action. As though there’s no reason anyone should ever have been more – well – human. I actually spent much of my professional career battling operators of nuclear power plants. I grew to realize they were not in fact motivated by “profit to themselves and their cronies.” It was to provide good service to the public at low rates. To the extent they did seek profits, it was mainly to further that aim via keeping their companies financially sound. And meantime, hundreds of nuclear power plants throughout the world have operated quite safely for decades. That’s what I mean by Welles himself displaying exactly the sort of narrow-minded stupidity he denounces. No – we do not refuse to recognize this. The true point here – the exact opposite of what Welles intends – is that we bravely go forward, knowing there are risks, but that nothing can be gained without risk. That’s why ships did not stop crossing the seas after the Titanic. And planes don’t stop flying because they might crash. And we don’t stop living in houses because sometimes they burn down. And – I hope – Deepwater Horizon won’t stop offshore oil drilling. The alternative – implicit in Welles’s book, though he doesn’t face up to it – is to “play it safe” and never take any risks. That would mean not getting out of bed in the morning. In fact, it would mean not even having beds, because we’d still be sleeping on the cold dirt floors of caves. When I heard a recent news report of a NY legislative bill to require skiers to wear safety helmets, I could instantly guess the sponsor: Brooklyn Assemblyman Felix Ortiz. Just for fun, I googled “Felix Ortiz nanny state,” and got quite a lot of hits. This Mr. Nanny State also attracted much publicity recently (maybe that’s his real point?) with his bill to prohibit restaurants from using any salt. I’m not making that up. Click HERE for a lengthy list of Ortiz’s legislative initiatives – proudly displayed at his website. Most of them seem, well, well-intentioned. In a perfect world, maybe most of these things would be done. In a perfect world, we’d live forever too. But no matter what we do, the human mortality rate is still going to be 100%. Given that reality, trying to protect people from every possible danger is chimerical. But, more broadly, what’s missing from this Ortiz legislative farrago is simple common sense. Common sense would consider whether a program’s benefits are really worth the costs. Cost never seems to enter the heads of nanny staters like Ortiz – not only costs to individuals and taxpayers, but costs to businesses in complying with all this labyrinthine legislation. If every Ortiz bill were passed, every business in New York would have to hire a brace of employees just to keep track of all the requirements. Of course, higher costs to businesses ultimately mean higher costs for consumers – and maybe fewer businesses – and fewer jobs – and, in the end, lower living standards. Who will protect us from that? Just as one example, we’ve actually heard a lot about making restaurants post calorie counts; it almost seems noncontroversial. But suppose you run a little luncheonette. How are you supposed to determine the calorie count in the tuna sandwich on your menu? Huh? Compliance with such requirements is bound to be an expensive nightmare for small businesses; maybe even making their businesses impossible. What we really need is protection from the likes of Felix Ortiz. Do child soldier atrocities prove the human heart is black? Someone gave me for Christmas Ishmael Beah’s book, A Long Way Gone. I smiled gratefully, though it felt like I’d been given a cupful of broken glass to swallow. I knew about the book – and all too well about the horrors it documents – and didn’t feel desirous of a deeper immersion. But eventually I made myself read it. Child soldiers like him are very common in Africa’s wars. They are brutalized and made to do vile things. I was relieved when I read that it was a “government” soldier that Ishmael became, because the “rebels” were worse. But perhaps it’s just a shade of difference. Both armies subsisted mainly by attacking villages, killing the inhabitants, and grabbing their stuff. This is not a tale to warm an optimist/humanist heart, certainly providing ample fodder for misanthropic pessimism. And yet . . .
One is struck by how much human sympathy could endure even in this pit of hell. Ishmael relates how he and some pals, wandering refugees and desperately hungry, espy a small boy eating corn. They grab it from his hands. The boy’s mother sees this. What does she do? She gives them more corn. Ishmael moves on, with no comment. But the thought of that woman, and her astonishingly open-hearted reaction, lingers. There were numerous other examples. At 12, Ishmael is a gentle, sensitive child. His first witnessing of violent brutality is a horrible shock, he is appalled. At 13, he is cutting men’s throats, sucked right in to the brutality. How could this happen? Does it prove there is something deeply rotten in the human soul? I’m reminded of Philip Zimbardo’s famous experiment wherein student volunteers were tasked with role playing as either prison guards or prisoners. The guards were soon showing shocking cruelty toward the prisoners. But Zimbardo himself disavows that his experiment proved humans are fundamentally bad. Rather, he says, it proves that our behavior is highly dependent on the circumstances in which we find ourselves. Indeed, our species’ evolutionary success is due, in great part, to our adaptability, the capacity to modify our behavior in accord with changing environments. That does mean we have the capacity for atrocious behavior when circumstances so dictate. Ishmael’s story shows this. But there is a powerful antidote: society. The whole point of society is to minimize the kinds of circumstances conducive to bad behavior, and to create instead the conditions wherein “the better angels of our nature” predominate. In the big picture, human society has been extremely successful at this. But it’s not a foolproof system, and so it’s vulnerable to the actions of fools. That’s what happened in Ishmael’s Sierra Leone, shredding the normal societal constraints; and in Rwanda, in Bosnia, in Gujarat, and too many other places, where fools have been allowed to unleash the whirlwind. As an optimist, I do believe we’re gradually seeing less of this, and the advanced Western societies are pretty unlikely to experience it again. But still, our society is not completely foolproof, and we’d best keep a wary eye on the fools among us. 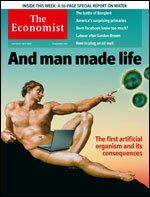 I loved The Economist’s 5/22 cover, showing the Sistine ceiling’s iconic Adam, but the other guy is absent. The spark of life is coming from Adam’s finger, to a bunch of cells; and he’s got a laptop in place of a fig leaf. 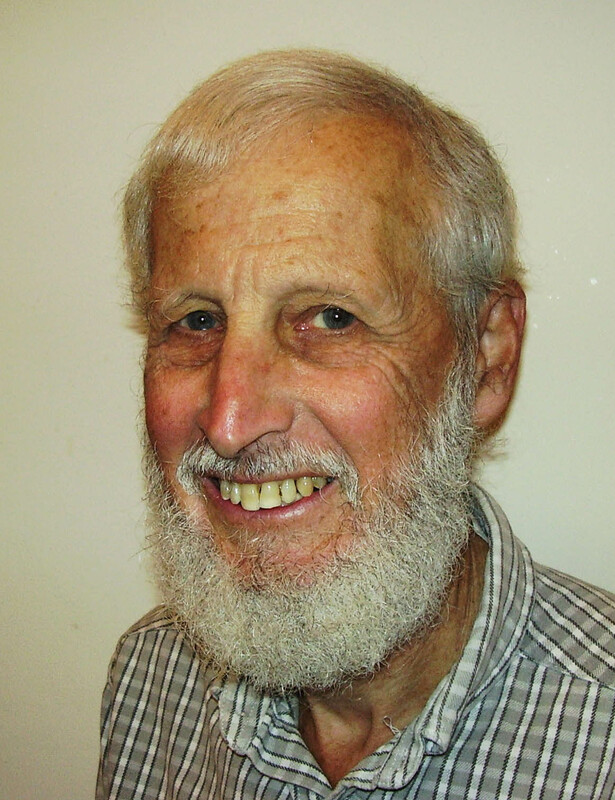 The reference is to the recent work by Craig Venter and Hamilton Smith, creating a new organism by replacing one’s DNA with artificial computer-generated DNA. It worked; the organism duly behaved as programmed by its new DNA. Playing God? The truth is, we’re on our own, and what we make of our situation is up to us, not some unseen power. “Tampering with nature” is in fact how we’ve always coped, starting with the earliest farmers who took some almost inedible weeds and transformed them into a plant nature never envisioned: corn. That was the first foray in genetic modification. Some voices see the Venter/Smith work as troubling and dangerous, warn of the potential for harm, and urge strict limitations if not an outright ban. Well, there is indeed potential for harm – as in every human endeavor. We don’t ban airplanes because they can crash. Every scientific and technological advance throughout history has been greeted by these same voices of alarm. The first railroads met with fears that high speed would cause organ damage. If such technophobes had their way, we’d still be living in caves. The potential benefits of the Venter/Smith work, meantime, are incalculable. It’s the ability to use nature’s own processes in ways that we direct, solving problems and improving the quality of human life, more effectually than ever. Putting fetters on creativity is not a recipe for human betterment. Nor, even, is it a recipe for safety. The genie of knowledge cannot be put back in the bottle; if bad people want to do bad things, no tangle of restrictions by well-intentioned fear-mongers is likely to hinder them much. A better approach (as The Economist argues) lies in the opposite direction, of greater openness; if there are dangers, we’d best have the biggest possible army of empowered and creative good guys to combat them. The rise of computer culture has been beset with worms, viruses, and hacker attacks. That could probably not have been prevented by fearfully clamping down on computer science. But by going the other way, the openness route, we have indeed deployed a creative horde of computer-savvy warriors who have been quite successful at containing the threats. Surely that openness in computer science has served humanity well. We should follow the same path on genomic science. And if, as the Economist cover suggests, God is out of the picture, perhaps we’re better for it. In the Americas. In ancient Europe, “corn” actually meant wheat, likewise a man-made creation.